When Sgt. Bruce Dunham was deployed for seven months to Iraq, Crystal Dunham visited the USO every day to use one of its computers to check her e-mail. Word from her Marine husband was worth gathering up the couple's two little girls and making the trip into town. "Anything was good," said Crystal, "even if it was just a couple of words from him." Thanks to a new organization called "Operation Homelink," Crystal will be able to read those words from home when Bruce leaves again for Iraq in just a few months. The mission of Operation Homelike is to help facilitate e-mail communication between deployed service members and their families back home. Operation Homelink takes older computers donated by corporations, has them professionally refurbished and gives them to service members. The organization, with the help of the USO of North Carolina, gave 100 computers away last week to local military families whose names were selected in a drawing. Bruce and Crystal were the 40th couple in line for the computers, each of which included a 233 megahertz Pentium II processor, a monitor, speakers, mouse, telephone cords and system instructions. Bruce said it was worth the wait." This is going to make it so much easier for Crystal. She won't have to take the kids out just to use a computer," said the 25 year old from Lockport, N.Y.
Of course Crystal, a Fayetteville native, will have to learn a little more about the family's new addition. "I know how to push buttons and e-mail, and that's about all I know," she said with a laugh. "She knows more than that," said Bruce, who is with 2nd Marine Division, Headquarters Battalion, Communication Company. "But I'm going to give her a few lessons before I leave." Operation Homelink, a non-profit organization, is the brain child of president and founder Dan Shannon. Not long after the attacks of 9/11, Shannon read a poem titled "I Got Your Back," which was written by Autumn Parker whose husband was serving overseas. It became the inspiration for Operation Homelink, which began two years ago and has now donated more than 700 computers to military families. "The poem really tugged at my heart," said Shannon, who works in commercial real estate and donates his time to Operation Homelink. "It's such a small way to give back to people who give so much." Camp Lejeune Base Commanding General Maj. Gen. Robert Dickerson stopped by the USO to help hand out the computers to his Marines. He called the entire Operation Homelink "a phenomenal project." Dickerson said he remembered when he served in Desert Storm, and the mail would run three to four weeks behind. "We've come a long way in communications in the last 10 to 15 years to make sure our families are able to stay better connected to their loved ones," he said. "Our Marines leave on deployments fully prepared to do the work of the nation, but our priorities are with our families. This is a great gift to them." Bruce said he couldn't think of a better one for Crystal. "People don't realize what it's like for the families," he said. "This is something that's not for those of us who are deployed, but for the families we leave behind." A nonprofit volunteer group has given 100 free, refurbished computers to military spouses at Camp Lejeune. The gift was coordinated by Operation Homelink, which to date has given refurbished, donated computers to more than 700 families.The computers are meant to give military families a low-cost way to stay in touch with service members stationed abroad. This gift went to spouses of the members of the 2nd Marine Expeditionary Force. 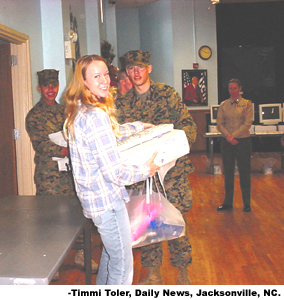 Jacksonville, North Carolina, December 24, 2004– Operation Homelink, in cooperation with the USO, presented one hundred refurbished computers to the spouses of the members of the 2nd Marine Expeditionary Force, Camp LeJeune, North Carolina. Most soldiers have email access on ships and even in desert outposts. Lower-ranking military families, however, are often not able to afford computers, and must rely on slow postal service or expensive phone calls to stay in touch. Operation Homelink, an all-volunteer, non-profit organization, strives to link American soldiers deployed overseas with their families back home through e-mail communication using donated computers. “I am extremely grateful for the computer because in addition to emailing my husband I am able to keep in contact with the other spouses in the battalion and pass information to them” said Julie Putney wife of Sergeant Joseph E. Putney assigned to 2nd Maintenance Battalion. "GROWMARK understands how important the ability to communicate is for family members separated due to military service. We can't think of a better way to 'recycle' computer resources," says Ann Mosby, corporate communications manager. “Operation Homelink is Looking for a Few Good Corporations to support our military families by simply sending us their old computers,” said Dan Shannon, President and Founder of Operation Homelink. 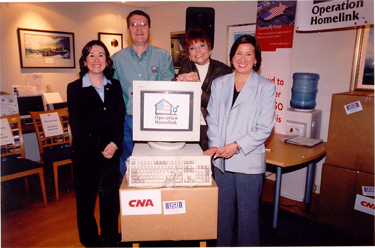 Operation Homelink accepts donations of qualified end-of-life computers from corporations. 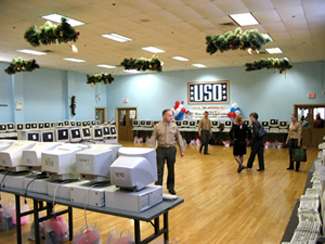 Large donations (minimum 25) of used computers (minimum Pentium II laptops, Pentium III desktops) are needed to effectively connect the thousands of military families wishing to communicate with their soldiers. This donation is tax-deductible and has the added benefit of reducing the number of computers filling landfills. Illinois State Treasurer and military Mom, Judy Baar Topinka, addressed a gathering of military families and news media to announce the donation of 200 computers by CNA Insurance and to encourage other corporations lend her support to Operation Homelink. “As our military men and women are called away to protect the interests of our nation during this time of crisis, connecting with their families via email can offer them the peace of mind that is so important to their well being. KILLEEN, Texas, April 30, 2004 - Families of Fort Hood soldiers have another avenue to stay in touch with loved ones deployed overseas- Dell today joined forces with Operation Homelink, a non-profit organization with a goal to provide refurbished computers to the parents and spouses of junior enlisted, deployed service men and women at no cost. The company will donate 100 refurbished notebook computers to enable family members at Fort Hood to e-mail those deployed outside of the continental United States. “Being able to connect with your family while being deployed helps maintain and sustain a soldier’s morale, and technology makes that possible today,” said Frank Miller, vice president, Operations for Dell’s Public Sector and former Major General, United States Army. Operation Homelink accepts donations of qualified end-of-life computers from corporations, and the group depends on corporate donations to keep up with increasing demand. For more information on requirements and how corporations can donate, visit www.operationhomelink.org. Dell's involvement with Operation Homelink is indicative of the company's commitment to providing technology access to those who need it—at school, at home or in their community. Other programs include the Dell TechKnow program, which provides low-income students with an opportunity to earn a home computer, and Dell’s work with the NBA Reading and Learning Centers.